Phil ‘The Power’ Taylor may have called quits on his time as a professional darts player in 2018, but the story of dart’s first-ever superstar will undoubtedly enter sporting folklore. Indeed, no-one in 1986 would’ve believed – himself included – that Taylor was destined for sporting greatness. The then 26-year-old Stoke man worked on factory floors, with his jobs including making ceramic toilet roll handles for £52 a week. Not the typical tale of a successful sporting career. But that’s exactly what happened, as Phil Taylor became darts’ first true superstar and a household name in the process – something which few people would’ve believed would be possible for a darts players just a few years before. 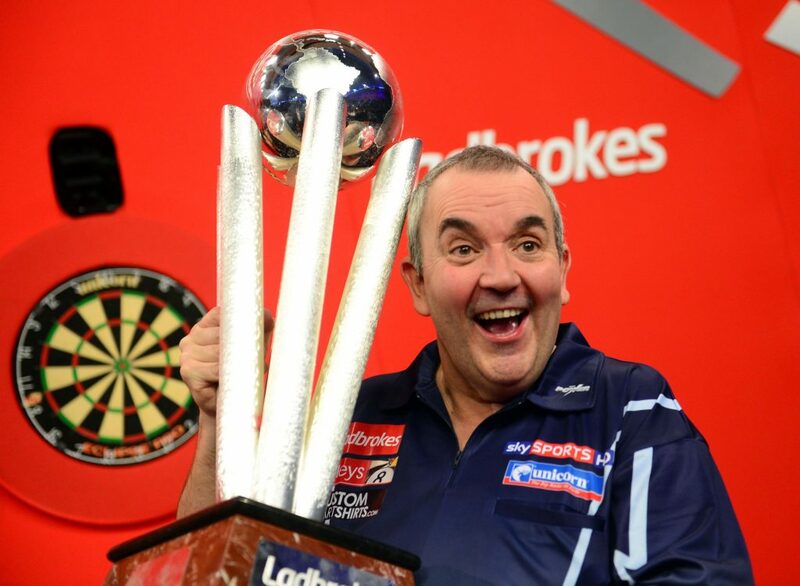 Phil Taylor celebrates winning World Darts Championship in 2013. It was quite the turnaround in fortunes for a man who was barely earning minimum wage in his mid-20s. So just how did The Power make his way from the factory floor to packed-out arenas in front of adoring fans? Taylor had often played darts as a child and as a young adult but had never taken then game particularly seriously. However, he began to play more after moving into a new place just down the road from darts legend Eric Bristow’s Crafty Cockney pub in Stoke-on-Trent in 1986. His wife then bought him a set of darts for his birthday, with Taylor playing with increasing regularity. Not before long, Taylor started playing for the county darts team, before he got a big break as Bristow took a shine to him and recognised his ability and potential, loaning him £10,000 in order to help him quit his job and pursue a professional career in the sport. Despite all his ability, Taylor struggled as a first-year pro, crashing out of multiple events in the early rounds, before winning his first title at the 1988 Canadian Open. Two years later, he qualified for the 1990 World Championship, before miraculously upsetting the odds to set up a final against his own mentor, Eric Bristow. Taylor didn’t stop there, comfortably beating Bristow 6-1 in sets to claim the BDO World Championship title as a huge outsider. It was the start of a new dawn for darts. Phil Taylor pictured celebrating with the crowd after retiring in 2018. For all the personal success Taylor was enjoying, the sport of darts was struggling, losing sponsors and TV coverage at a rapid rate. This led to a player revolution in 1993, with players, including Taylor, breaking away from the BDO in order to create a new darts organisation that would better serve the sport: the World Darts Council (WDC), before later becoming the Professional Darts Corporation (PDC). It was no easy move though, and not only did Taylor help lead the darts revolution, he also dipped into his own pocket to help the PDC become what it is today, being one of a handful of players to financially support the fledgling breakaway organisation in their lengthy court battle with the BDO. This move was a defining moment for both the sport and its star player. Over the next couple of decades, darts went from strength-to-strength commercially, and now packs out arenas full of fans on a regular basis in the UK and across Europe, with its Premier League Darts and Champions League Darts competitions, while millions tune in to watch the games unfold. It’s been an incredible turnaround for the sport, that used to be considered merely a pub sport that would, at best, be competed in smoky social clubs and little more even for a major tournament. At the age of 57, Phil ‘The Power’ Taylor retired from the sport as the most decorated darts player of all-time, paving the way for a new contender to emerge. Of course, it wasn’t just The Power’s commitment to helping the organisation of darts, he also set the standard for players. No longer is the sport just considered a pub pastime, it’s now a very lucrative career for those that follow in Taylor’s footsteps when it comes to training and precision. On his day, there was no player more consistent nor better able to deal with the pressure that Taylor, and that kind of mentality is exactly what you see in the likes of Michael van Gerwen and the “new breed” of professional darts players. There’s no doubt of the impact that Phil Taylor has had on the sport. His legacy has taken many forms, with Michael van Gerwen stepping into the limelight as the sport’s star player, while his protege, Adrian Lewis, who also hails from Stoke, is one of the leading players on the circuit. Then, of course, there is Rob Cross, who looks set to use his victory over Taylor in the World Championship final – a remarkable achievement in his first year as a professional player – to establish himself as one of the world’s best, despite his career still being very much in its infancy. Up-and-coming players have a lot to thank Phil Taylor for. From the quality of the promotion to the standard of play, the sponsorship deals to the darts fandom, the packed arenas to the huge prizes, Phil Taylor’s legacy can be seen in every facet of the sport.